I am lucky enough to work at 12:30 today, so I get to relax on this chilly morning. Every morning, I wake up at 6:45 (sometimes 6:59… >.>) for breakfast at 7:00. Hiroshi (my host dad) makes breakfast for me every morning and man is Japanese breakfast good! Each morning is different, but there are the essentials: a bowl of rice, a bowl of miso soup, pickled cucumber/veggies, and green tea. The main course changes. This morning it was an egg roll with cooked turnips in a meat broth… Mmmm…. Yesterday it was big bowl of rice with chicken and egg.. Mmm… And my favorite was a cabbage wrap with pork, onion, mint, and other spices…. Yeah, mmmmm…. It’s pretty obvious to see that one of my favorite parts of traveling is trying new foods. Let’s see. I’ve been in Azumino for a week now and have finally realized something, this city has a very similar feel as Eugene, Oregon. Young people wear baggy/hemp cloths, composting and sustainability is big here, there is a large art scene, and eating locally grown food is a must. The cafe I work at, as I said before, is filled with local art. 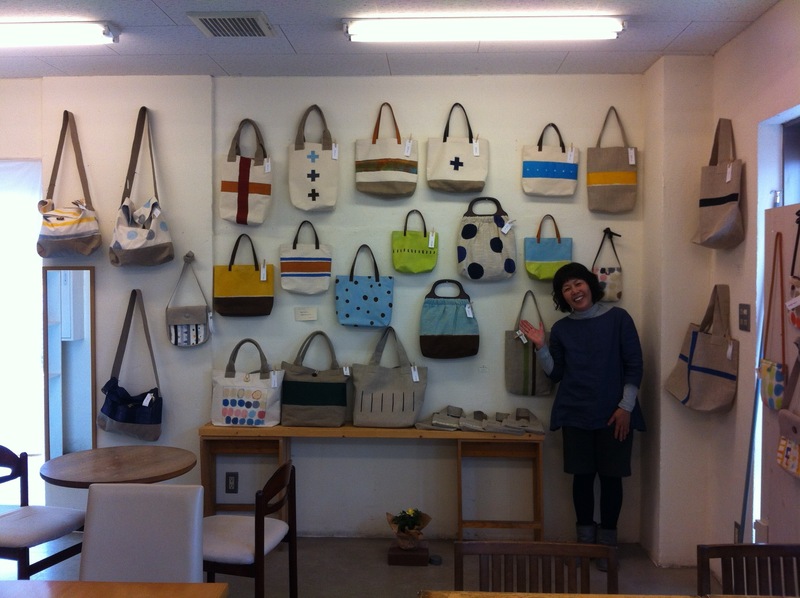 Well, for the last 2 days an artist named Muki-San has been premiering her new bags. People from all over Nagano Prefecture are coming to Hitsujiya Cafe to buy her purses. Hiroshi told me she is very famous in Nagano and is well known in Tokyo too. How cool is that?! I had Thursday off because the first day of Spring is a government holiday. I decided to jump on my bike and explore more of Azumino. My host Mom (who is named Kinu-San), told me that Azumino is very famous for its Wasabi farms. People from all over the world come to Azumino to learn how to take care of wasabi. To prove that point, while I was biking earlier that day I bumped into 2 guys from Portugal. They were here to make business with a wasabi farmer. I looked on the map and found “Wasabi Nori,” and I headed South. It took me about 20-30 minutes to get there. The farm is very big and it is chalk-full of wasabi plants. I learned quickly that the farm is mostly water and rocks. Wasabi plants grow healthy and strong with cold water and rocky foundation. I walked around the whole farm with my arms crossed behind my back, smelling the wasabi, and listening to the birds. “natsukashii”… A sweet memory. The best part of the farm you might ask? 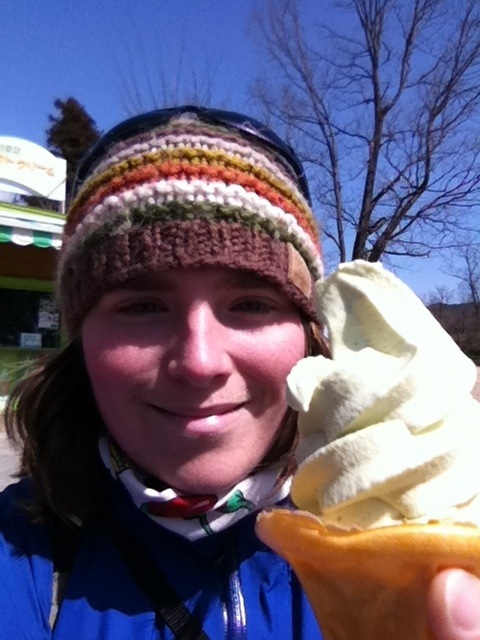 Well, I gotta say it was the wasabi soft cream. I was skeptical, but the sweet cream and the spicy wasabi flavor worked rather well together. Who would’ve thought? 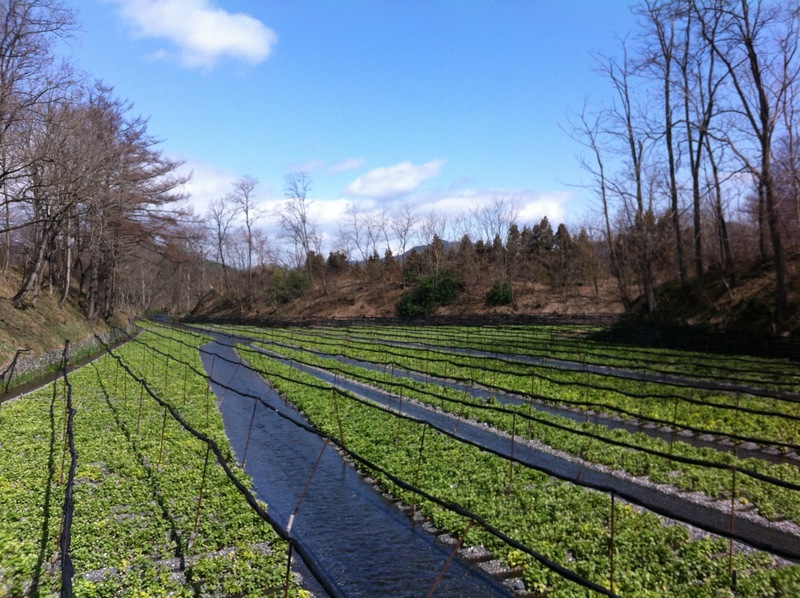 a field/marsh of wasabi plants. As I kept going up the mountainside, I saw a quaint road/trail. I thought, “why not, let’s check it out!” I followed the path for a while. It was very woodsy. Lots of conifers, it really felt like Oregon. As I was walking I recognized someone from the Cafe! Her name is Mari-San and she runs a guesthouse called Shalom Hutte. I had magically found her GH. She welcomed me in and introduced me to Erica, an American! Huzzah! Erica works at the GH for room and board. Erica showed me around. The GH has a cozy public space, a locally made clothes shop, and a vegan restaurant (am I in Eugene? Honestly?). They also have an Organic Farm. Erica and I were walking outside, looking out over Azumino. While, we were walking I heard a trumpet in the distance. She told me one of the farmers practices in the fields during his breaks because he’s too loud inside the house. The whole ambiance was charming. The beautiful view, the good company, and the music made that moment for me unforgettable. I met the trumpet player and he turned out to be a very handsome guy who was my age. 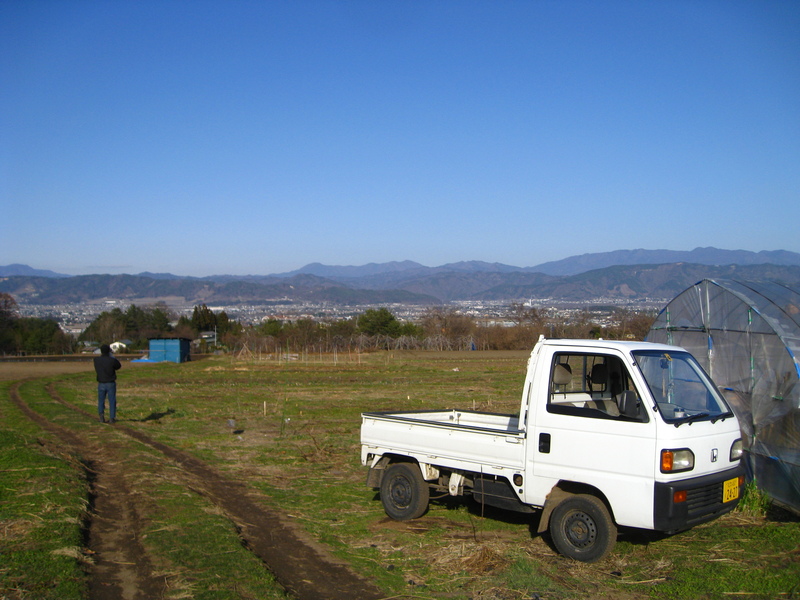 He’s from Tokyo and wanted to escape the city and learn how to organically farm. I asked him if I could take video of him playing trumpet and he agreed. I set up my equipment and he warmed up a bit. When all was ready and I pressed record, he did something that I will (for the second time today) never forget. He started to play the opening theme from Laputa, Castle in the Sky. I was in awe. I found myself just looking into the distance, watching the clouds go over the mountains. There were even swallows flying around us, which is almost equal to the doves that were in Laputa. I closed my eyes and and let the music takeover my mind and body. I imagined myself in the movie, playing my clarinet beside him and watching the pet doves fly out of their cage into the sky. Just… Wow. Now that was magic. 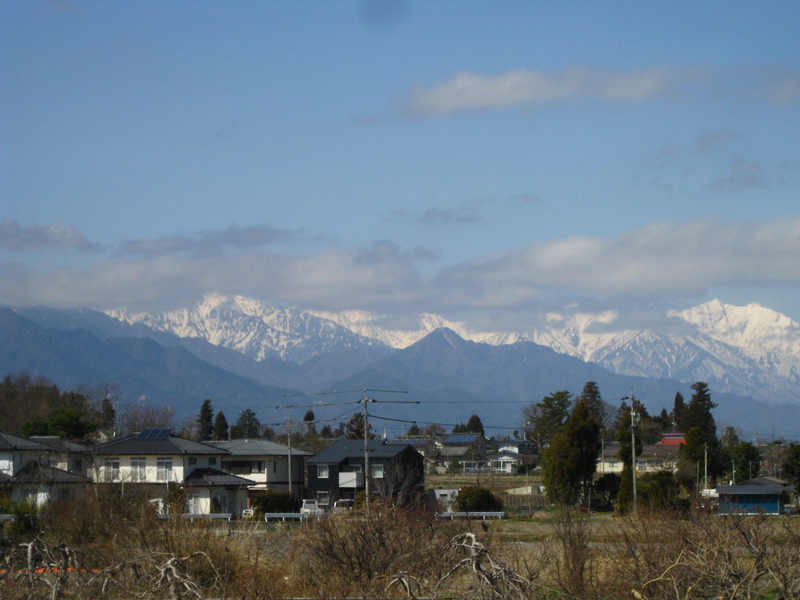 The Japanese alps. I see them wherever I go. The trumpet player. It was hard for me to leave the GH, but it was getting dark and a cold wind had started to brew. I bid farewell to my new friends and flew down the mountainside, racing the sunset. I will remember that day fondly for the rest of my life. The next day was just as wonderful (“sticki”), but in an artsy-fartsy way. I’ll tell you another time. I was thinking about how you said you might make your way down here later on? I could meet you in Fukuoka, or Nagasaki. Those are both exciting cities. The further south you get the mellower it gets. I don’t know what your plans are or what you are up for, but I thought I would suggest that I could meet you either of those places. Or maybe I already said all this? Anyway, I live in Shibushi, very far south on the island. There is a nice hiking area nearby, waterfalls and gorges, and apparently a scale replica of the Easter Island statues on the coast. Kagoshima City and Kumamoto are also nice cities. Yes, the pictures are a must. 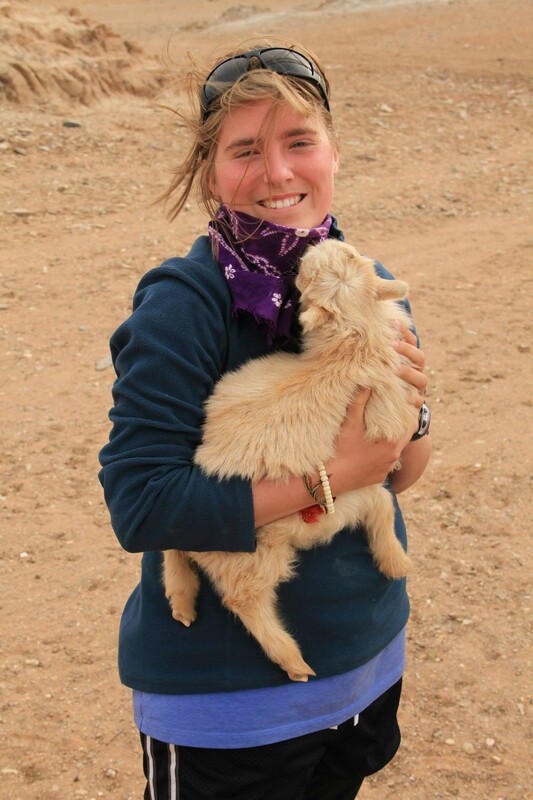 Hi Molly… love the stories & snipets of your journey. I’ve been working the last two years on a project raising wasabi in greenhouses here in Oregon and Washington state. Very interesting plant that’s coming across the pacific. 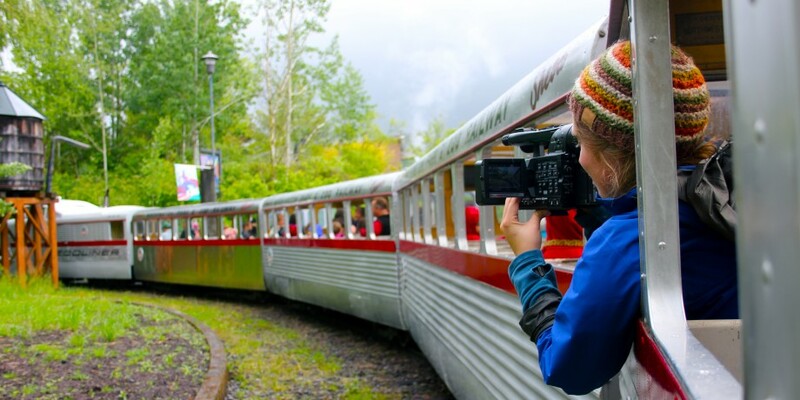 Keep up the stories!